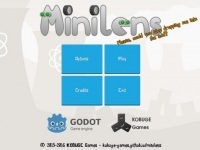 Minilens is a puzzle game with simple and straight-forward graphics and layout. The main mission is to help Minilens, the robot alien, to destroy all radioactive barrels while collecting flowers for research. In each level is provided with detail description that helps you solve the puzzle. Basically, it only uses arrow keys to move the robot and spacebar to explode a bomb. Push all radioactive barrels into acid lake. What challenging is some barrels are located on unusual place or need to be exploded with a bomb, so the solution could be tricky occasionally.